Your lawsuit officially begins when you prepare and deliver to the small claims clerk a small claims complaint. A complaint is a legal document in which you state the names of the parties, the nature of the claim, and a request for relief. All lawsuits began with the filing of the complaint, from small claims cases to cases in America’s highest courts. A small claims complaint is far more informal and far more forgiving than a complaint in an upper court civil action. A lawsuit is officially begun when the clerk of the small claims court accepts a complaint for filing. These days most complaints are available in fill-in-the-blank forms. You can obtain these forms either by visiting the court or in some cases online. Drafting a complaint is actually one of the easier tasks you’ll undertake as a plaintiff in your small claims case. If you are a defendant you would obviously not prepare a complaint, you would be the person upon whom the complaint would be served. Because you have already researched your case, analyzed your parties and venue, and framed your case in terms of specific causes of action, the drafting of the complaint is simply committing what you already know to writing. Small claims forms are generally pre-prepared and nearly complete; you simply need to fill in a few blanks with some basic facts about your action. Let’s examine Figure 7.1, which is a California small claims complaint. This is the document that a plaintiff would file with a small Claims Court to begin a case. 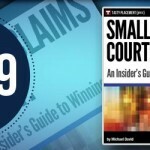 Note that in California the complaint is titled “claim and order to go to small claims court.” California recently revised its form for 2007. The California form is a model of simplicity and clarity and will serve as an excellent illustration of how to complete a small claims complaint. After you have prepared your complaint, review it for accuracy. Be sure to double check any dates you may have included. An incorrect date can affect the validity of your claim. When you are ready to file the complaint, you’ll bring the original complaint and several copies to the small claims office in the County where you want to file your case. The court clerk may require that you bring several extra copies — that will differ from state to state. To be safe, bring four extra copies. The clerk will stamp one copy for you with the date of filing and you’ll keep that copy for your files. You’ll also need a copy upon which you will serve the defendant, but we’ll discuss that further below. The court will require you to pay a filing fee when you file your complaint. The filing fee will range from $15-$70. We have not included filing fees in the state-by-state reference tables because they change so frequently. As you might imagine, filing fees tend to creep upward from year to year. If you’re poor, you may be able, in some states, to file an affidavit or motion “in forma pauperis,” which will allow you to proceed without a filing fee. Check with the court clerk to see it such a filing is available. Generally, in forma pauperis motions and affidavits tend to be rather lengthy and invasive; you will be required to submit very detailed information about your assets and financial condition. Keep in mind that you have the option when filing your case of going to the court clerk yourself or sending someone else for you, such as an employee or a legal filing service. You can find legal filing services in the phone book or in an Internet service directory. The legal filing services are convenient because you can generally fax the papers to the service and they take care of everything. If you’ve never filed a small claims case before, I would recommend you file the case yourself because you have the opportunity to learn about the procedure and to have the opportunity to speak to the court clerks and a small claims advisor if your state has one available. You have one important choice to make when you file your complaint: the date and time for the hearing. A small number of courts choose the hearing date and time for you. Most courts will allow a plaintiff to select the date and time for the hearing when they file a complaint. There are a few factors to keep in mind. First, you need to make sure that you leave enough time to serve the defendant with notice of the lawsuit. Keep in mind that a defendant is entitled to a fair amount of advance notice before the hearing date. Obviously, it would not be fair to serve a defendant on a Tuesday night for a hearing on the following Wednesday or Thursday morning. The amount of notice to which a defendant is entitled will depend on state law. Notice statutes generally give a defendant between 20 and 30 days of notice before appearance at a small claims hearing. Service and notice are serious matters. If either service or notice fails, the defendant can later reverse the judgment. If you have the opportunity to pick the hearing date and time you have an opportunity to strategize to your advantage. Ideally, you may wish to pick a hearing date and time that is the least convenient for the defendant. If you are fortunate enough to know the defendant’s schedule you have the option of choosing hearing date for which the defendant cannot attend, or can only attend with some difficulty. Keep in mind though, that court dates can be changed; if the defendant truly can’t make the hearing that he or she will change the date. Once you have filed your complaint, you’re now a plaintiff in an active lawsuit. Your next step is to make “service of process” upon the defendant. Service of process, more familiarly known as “service” is a legal term that refers to the procedure employed to give legal notice to a defendant of a court case concerning a person.